Adrian Lam believes speculation over George Williams' future has impacted on his form. And the coach plans to speak to the England international ahead of Friday's visit of Huddersfield to try and help him blinker out the off-field issues. 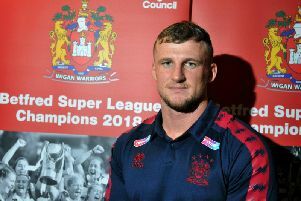 Speculation is intensifying Williams has been in talks with Canberra for 2020, a move which would reunite him with John Bateman and Ryan Sutton, if a transfer fee can be agreed with Wigan. New Zealand Warriors are also circling the 24-year-old. Williams failed to stamp his authority on Sunday's 18-16 loss at newly-promoted London Broncos. And Lam thinks the reported interest in him had an impact. “I think it may have affected him last week, without a doubt," he said today, at Warriors' weekly media-briefing. "If he is in negotiations with them then it’s got to take an effect on him. I think it probably did last week in the performance, you could see some of that. “And that would affect any human being that’s talking about leaving his hometown team and signing for a team on the other side of the world and leaving his family. “I’m going to talk with him this week - I’ve already spoken with him on a short-term basis on whether he’s okay with all of that. “He obviously doesn’t handle that side of things well, as in balancing that up with having to perform. “He’s got a lot of decisions on his mind at the moment and it’s probably something that we need to tick off and move on from as soon as we can, as a club and him as a player. "The longer this drags on the more it’s going to affect him." Williams has been linked with several NRL clubs in the past and has never shied away from the fact he wants to try his hand Down Under at some stage in his career. He was handed a marquee contract by Wigan in April 2017, meaning only £75,000 of his lucrative contract counts on the salary cap. The academy-product is under contract with Wigan until the end of 2020 - with an option in the club's favour for 2021 - meaning the Warriors could demand a fee to release him. “I know he’s close to his family, and I know going to the NRL is something that he dreams about one day," said Lam. “That was discussed in September last year because that was on the table at that stage as well. “I know he wants to do all of that, but I also know that this is his hometown and he loves this place." Meanwhile, he hopes to discover tomorrow whether Joe Greenwood has been cleared to play in Friday's match. Dom Manfredi, Ben Flower and Gabe Hamlin are fit to return, as reported today.